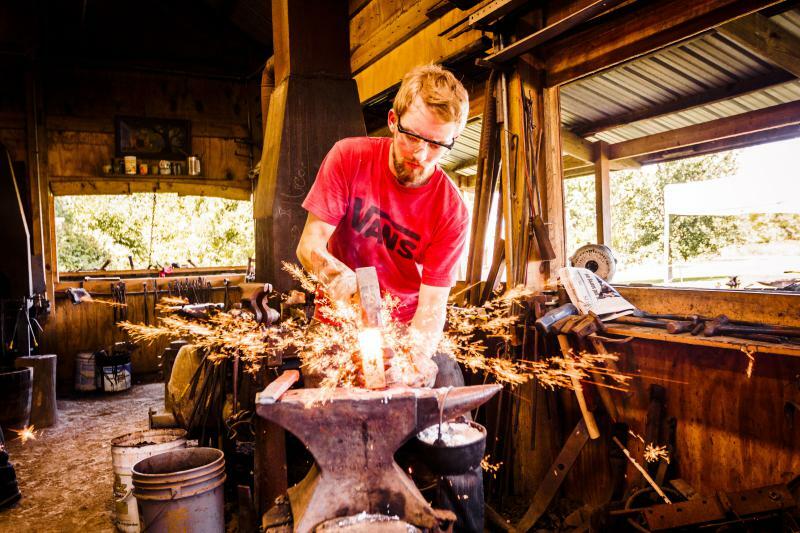 Artist Andrew Jumonville working on his firefighter sculpture inside his backyard shop in Bloomington. 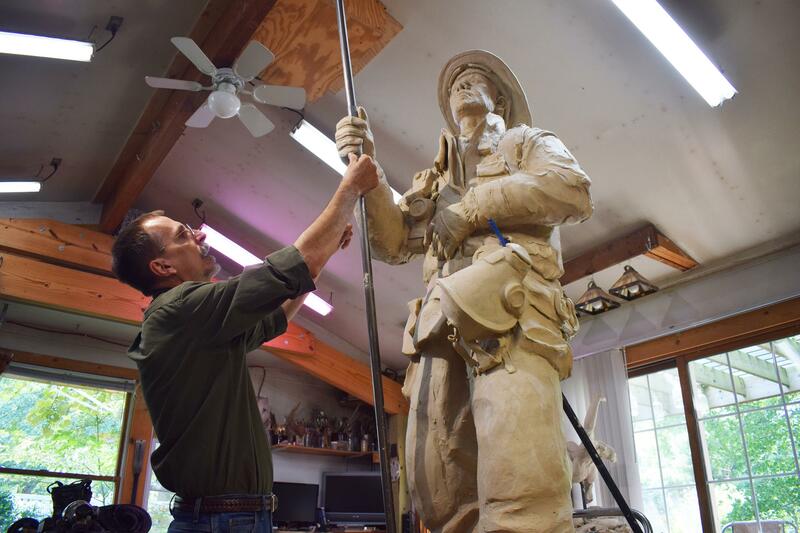 It was a sculpture—still in clay form—of a Bloomington firefighter. He stood tall, surveying an unseen emergency to which he's responded. He was draped in the tools of the trade. Heavy equipment. An oxygen tank. Helmet. A New York hook for pulling and prying. Jumonville's attention to detail on that stuff is amazing, but it's not the star. "When I look at something like this, all that stuff that’s hanging on him, all that decoration, that baroque kind of rococo stuff that’s on the crust, I’m not looking at that. I’m seeing a guy in his underwear," Jumonville joked. "What’s the man underneath? Getting that expression right is going to be everything. The heroic nature of the gear, I’m not looking at that. I’m looking at the humanistic qualities that are going on underneath all that stuff. It's still a man doing his job." 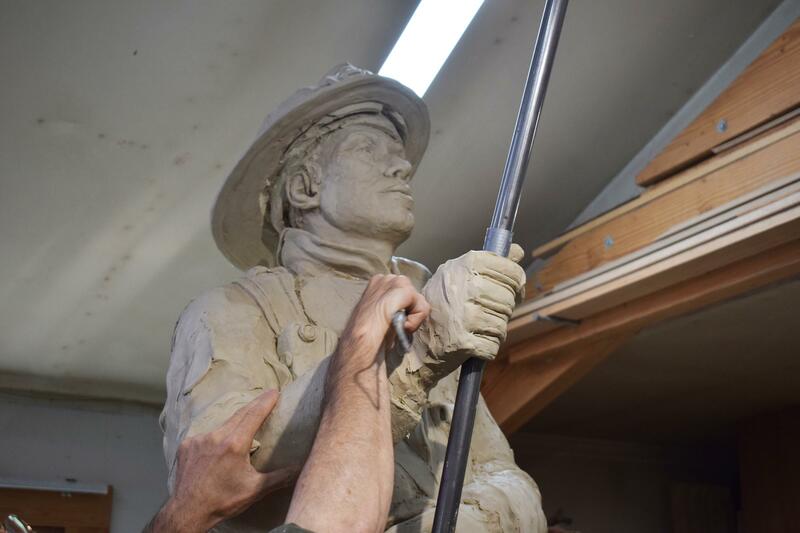 Jumonville's bronze sculpture will be unveiled Saturday at the dedication of the new Bloomington Fire Service Memorial at Miller Park, honoring 150 years of service to the community. GLT visited Jumonville over the summer when he was still carving out the sculpture in his backyard shop in Founders' Grove. A project like this took hundreds of hours of work. 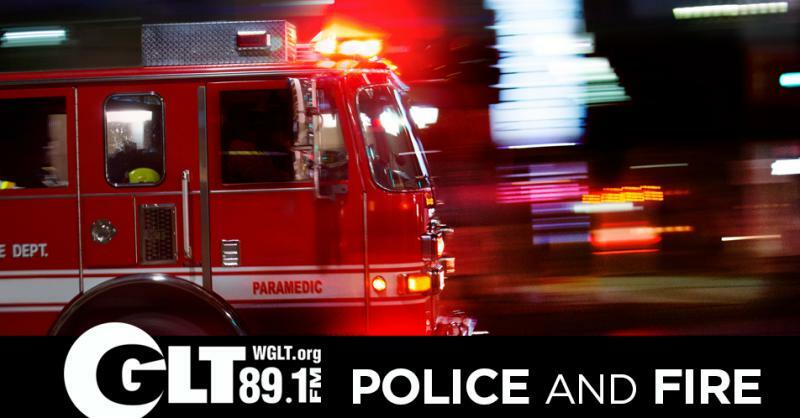 It began months ago with a real-life firefighter who struck a pose at a work session, attended by Jumonville and the committee that hired him for the project. "I got there with an actual firefighter. Dressed him up, posed him a number of ways," he said. "We had a live doll essentially, sort of messing with him." "On Day 1, it’s a couple pieces of black pipe and spray foam. I just make a big blob essentially, sort of generally the idea, and then it's just a matter of carving into that foam to get the general mass of the piece," he said. Then Jumonville covered it all in oil-based clay—around 200 pounds of it. He precision-carves that into shape, with all the nooks and crannies of the final sculpture. Later he put the firefighter in the back of a box truck and drove him to a foundry in Indianapolis. "I'll drive him over there in the middle of the night most likely, because heat is my enemy," he said. "It won't melt but it will be delicate." The foundry is where they made a mold of it, then a wax of it, then eventually it got burned out and cast in bronze. That's what's being installed at Miller Park. Jumonville likes to do most of the work for his projects. "I have a skill set that allows me ... I can do every stage of the production of this thing, other than pouring the hot metal. So, I can weld it and make the molds and waxes and that sort of stuff. I like to maintain that level of control because in each one of those iterations of the piece is another point of manipulation of the surface. So, you can dress it and tool it. There is a whole range of subtle mark-making in each one of those phases." This is hardly Jumonville's first public sculpture in Bloomington-Normal. He's worked all over the country. You've probably seen his work yourself. There's the "Kickapoo Shaman" at Lake Bloomington. And the well-known "Convergence of Purpose" statue featuring Abraham Lincoln, Jesse Fell and David Davis outside the Bloomington Center for the Performing Arts. Jumonville attended Illinois State University. He actually trained as a painter. But he said painting can be a little bit of smoke and mirrors. "I like the tactile quality of (sculpture). I think that I was always interested in sculpture," he said. "The paintings I used to do were dimensional. Sculptures are kind of hybrids of this. 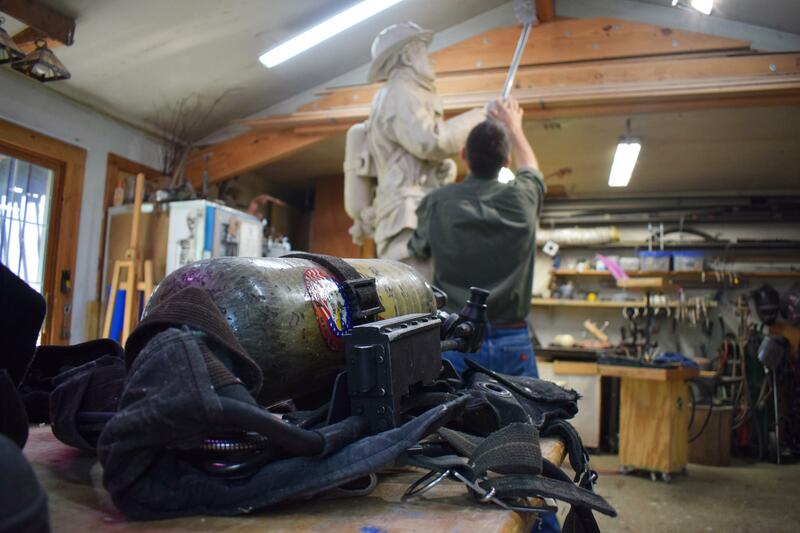 Andrew Jumonville said he spent hundreds of hours on his firefighter sculpture, which will be unveiled Saturday at Miller Park. 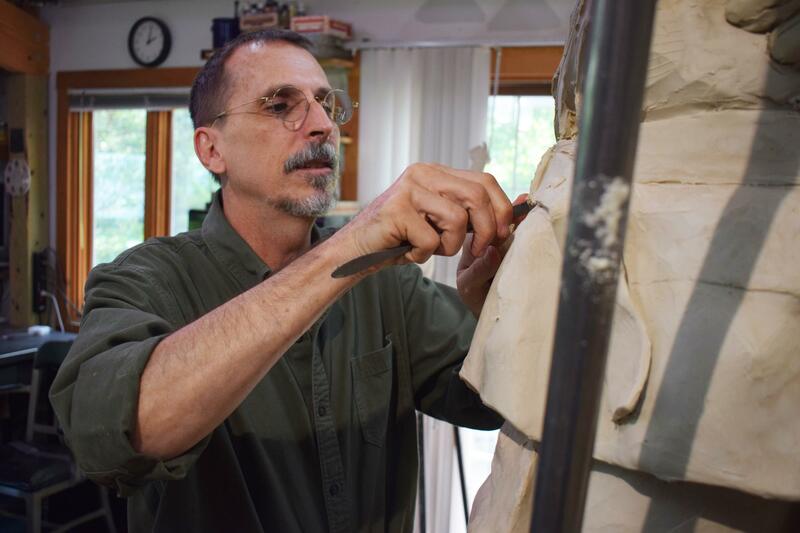 "I like the permanency of sculpture. It's going to be around, right? I also like the public forum quality to this. Paintings require a more intimate setting, and pretty much demand a contemplative environment in order to actually experience the thing the way you want people to see it," said Jumonville. "I think sculpture, especially this larger public stuff, people come to it on purpose or by accident, right? Because it’s a physical thing, there is already a pathway into the conversation that you have with the work. It’s a thing and people relate to things, and it’s a much easier 'in' to the viewer. Once you've got them you can start to explore the other ideas the piece may have." Bloomington Fire Chief Brian Mohr said he's happy with how the sculpture turned out. "It’s absolutely amazing, it really is. Andrew is a very gifted artist," Mohr said. "Of course, the face is supposed to be a general face. We're not making it specifically someone from the department." Mohr was particularly impressed with the detail on the equipment. 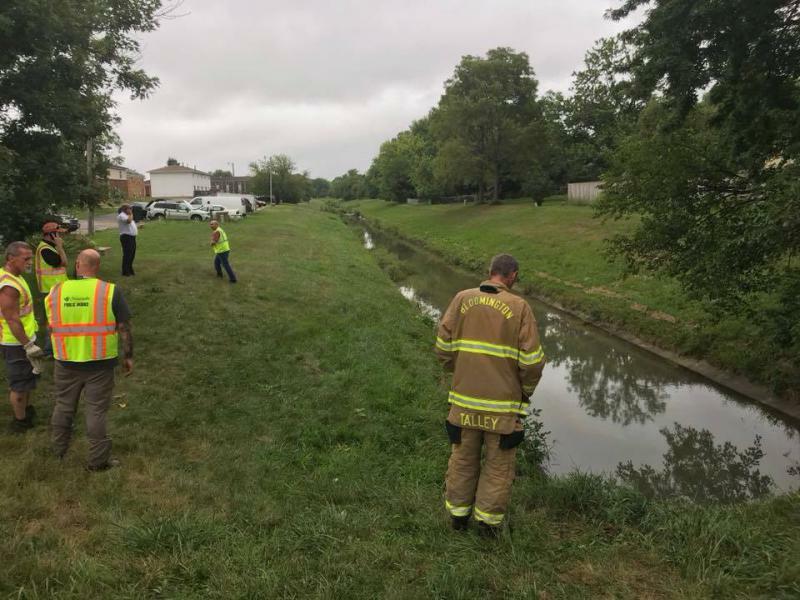 "From the lettering on the coat that’s worn, to the flashlight hanging on the belt, the helmet with the shield of the B-F-D, it's very representative of the Bloomington Fire Department and what we provide our employees for safety and personal protective equipment," he said. Again, for Jumonville, it's not just about the equipment. But he did take the time to get it right. He had a full set of gear in his shop with him as he carved the clay. So what does Mohr see in the firefighter's posture? 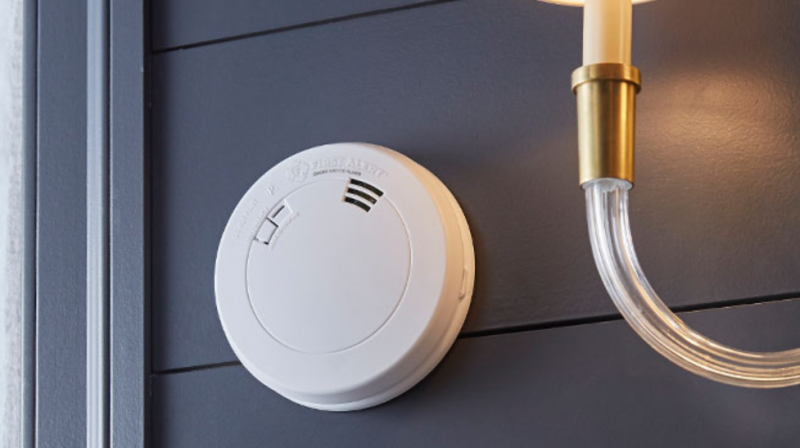 "He is standing looking at the hazard he is about to enter, and he is getting his situational awareness in order, as to what he is about to embark on. The hazard he is about to face, that he knows what he is getting into, and he is doing this to protect others. He has that surreal look on his face, that he knows what he is going into, and he knows it could be dangerous, but he knows the job that has to be done." 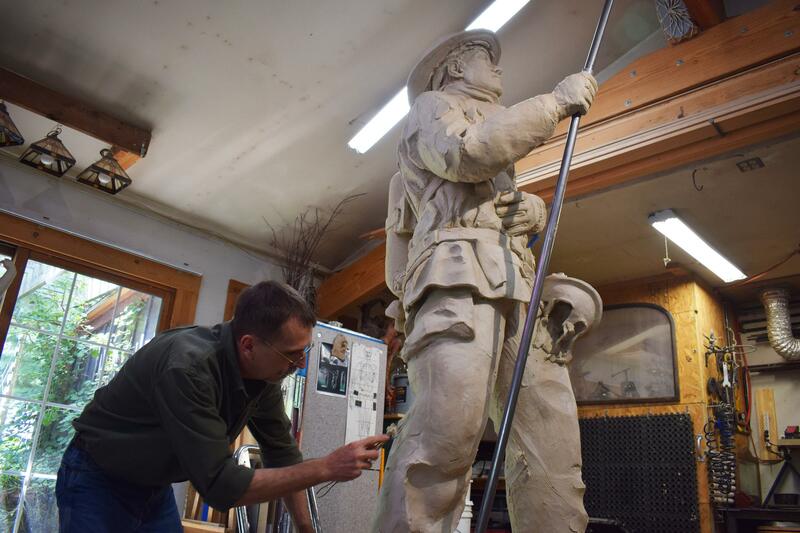 Jumonville's sculpture will be featured in the new Fire Service Memorial that will be dedicated Saturday at Miller Park. The centerpiece will be the refurbished bell from the fire department's original headquarters station. It's been at Miller Park for years, but without any sort of explanation about its origins. That'll change with the new memorial, which will have two branches—one for the fire service, and another for those who've died in the line of duty.